Today’s comic was based (vaguely) on actual events. See, the Prez came to my town Thursday for about 17 minutes, most of which was spent at a Caterpillar plant giving a speech. So here’s a comic about him at a Cat plant getting grilled by Angela Anonymous, ace reporter for the Non-Existent Times. 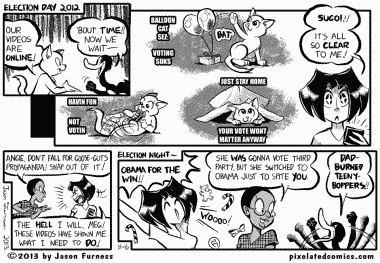 Hmm, looks like the Obaminator is the first U.S. President to know what a fansub is.. Unfortunately, real life got in the way of me finishing that comic I promised yesterday. As I type, they just swore in that “Joe Buddins” character, and they’ve got Yo-Yo Ma on stage. Uh-oh! Here come th’ Judge – It’s happenin’!